We created our CANIDAE® Grain Free PURE Ancestral formulas because dogs thrive on a diet high in animal protein, just like their canine ancestors. Our Red Meat Adult Dog Formula is made with an abundance of regionally sourced red meat species, including deboned lamb, goat, bison, wild boar, and venison. In fact, each 20-pound package is made with as much as 14 pounds of meat ingredients! We make each formula with a variety of ranch-raised, farm-raised, or wild-caught ingredients for high animal protein and the powerful nutrition your dog needs. 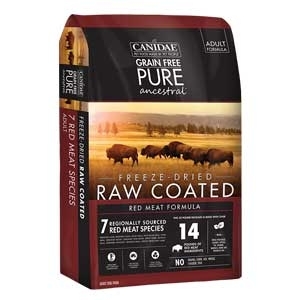 Then we raw coat our kibble with freeze-dried meats for the amazing taste your dog craves. We also use locally sourced vegetables, legumes, and herbs. Choose from our fish or red meat adult formulas, or adult and puppy avian formulas. 20lb.